TYLER, Texas – Behind four starters in double-figures and a career-high 11 points off the bench for freshman Andrew Eberhardt, the LeTourneau University men’s basketball team would pull away late for an 82-68 victory on the road over Texas-Tyler at the Herrington Patriot Center in Tyler, Texas on Saturday, January 26. LETU picked up their 12th win of the year to improve to 12-7 overall on the season while the Patriots slipped to 8-12 overall after dropping their second-straight game. The YellowJackets would see Texas-Tyler score seven of the first nine points of the game and would trail 7-2 two minutes into the game before a Justin Moore layup would cut the lead down to three. Moore’s layup would spark a 7-3 spurt for LeTourneau that would give LETU a 10-9 lead as Caleb Loggins would step out beyond the arc to hit a triple with 16:07 left in the first half. Both teams would continue the back-and-forth action throughout the opening 10 minutes of work as a C.J. Bird layup, and free throw would put the YellowJackets up 17-15 momentarily until a Darius Alford layup tied the game at 17-17 with nine minutes gone by in the period. Continuing to battle, LETU would go on a 7-2 run after trailing 21-20 to take a 27-23 lead as the two squads would endure two-plus minute scoring drought. The steady offensive flow from LeTourneau would continue into the waning minutes of the first half as the YellowJacket lead would grow to as many as ten before ending the half with a 39-31 lead at intermission. Texas-Tyler would open the second half with an 8-0 run to tie the game at 39-39 just 2:04 into the period but give up an 8-0 to LeTourneau over the following 3:06 which would put LETU up 47-39 with 14:50 remaining. A stout defensive effort from the YellowJackets saw the Patriots go 4:56 without scoring as LeTourneau pushed their lead to 12 before a Xavier Fogle triple ended the UTT drought to cut the LETU back to single-digits. Another 7-2 run for LeTourneau would give the YellowJackets a 14-point advantage at 58-44 with 11:05 remaining, but the Patriots would refuse to go away quietly and cut the lead back down to seven at 58-51 with 9:48 remaining. The LETU lead would hover around the 10-point mark over the next several minutes as the two teams would trade blows on each offensive possession with neither team being able to make any headway on defense. After a pair of Texas-Tyler free throws would cut down the LeTourneau lead to seven at 68-61 with 4:41 remaining, the YellowJackets would respond with an Eberhardt triple to put LETU back up double-digits. LeTourneau would manage to pull away down the stretch by doubling up the Patriots 14-7 over the final 4:25 and claim a 12-point victory. Two days after hitting just 5-of-20 three’s (25 percent), LETU would connect on 13 triples in the game to outscore UTT 39-27 from beyond the arc. 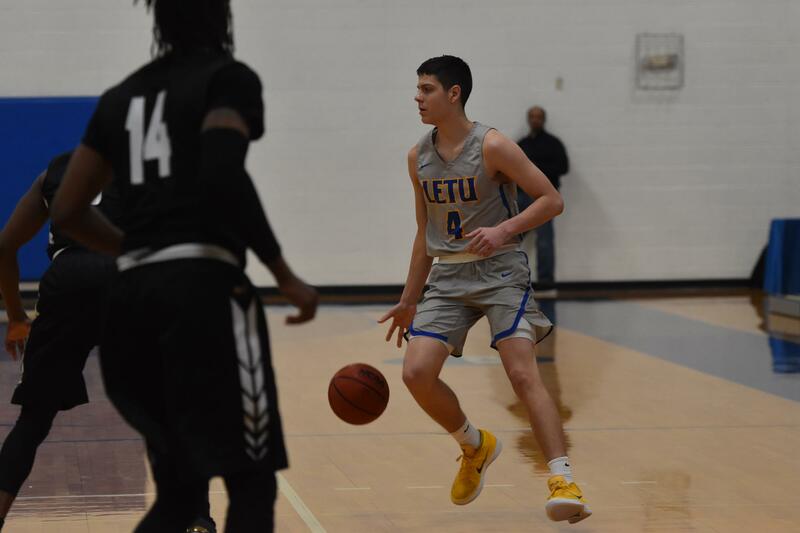 Limiting their turnovers would also prove to be a big key in the YellowJacket win as LETU would be guilty of just eight turnovers in the game while outscoring Texas-Tyler 15-7 in points off turnovers. Leading both ends of the court for LeTourneau would be Loggins with 20 points, 12 rebounds, and five blocks while Nate West and Moore both scored 17 points each. Eberhardt’s 11 points would come on 4-of-9 shooting which included three treys while also grabbing a team-high 13 rebounds. LeTourneau will go for their sixth-straight victory over Texas-Tyler when they turn around and host the Patriots for the second consecutive game between the two squads on Thursday, January 31 at 7:30 p.m.
TYLER, Texas- Trailing 33-32 after three-quarters of play, the LeTourneau University women’s basketball team was unable to shut down the University of Texas-Tyler offense in the final quarter of a 61-44 road loss at the Herrington Patriot Center in Tyler, Texas on Saturday, January 26. The loss drops the YellowJackets to 5-14 overall while the Patriots snap a three-game losing streak and move to 11-8 on the season. The game was considered a non-conference play due to Texas-Tyler transitioning to NCAA Division II. Prolific shooting performance from beyond the arc would be the difference in the opening quarter for the YellowJackets as LETU would jump out to a quick 6-4 lead before seeing the Patriots battle back to tie things at eight with 2:49 remaining. The score would be deadlocked again with 18 seconds remaining after the two squads would split the next 10 points of the game until another triple by Keauna Whitfield put LETU ahead 16-13 as time expired. Turnovers would haunt both teams in the opening five minutes of the second period as only six points were recorded on both ends of the court with defenses locking down the hoop. Both continued to exchange leads, the score would be tied two more times down the stretch until a layup in the final minute by the Patriots allowed UTT to take a 24-23 lead heading into the break. Texas-Tyler would extend their lead to four in the opening minutes of the second half, but LeTourneau refused to let them out of their sight by pulling within one on an Alexandria Thorne triple with 3:21 left. Thorne would go on to complete a successful trip to the charity stripe two minutes later to give LETU their first lead of the half second half, but a layup in the final seconds would result in another lead change and allow the Patriots to claim a one-point lead heading to the fourth. Having avoided a scoring drought through the first 30 minutes of action, LETU would be forced to endure a 4:11 cold snap that allowed Texas-Tyler to go on a 13-0 run that put the YellowJackets in a 45-32 hole. 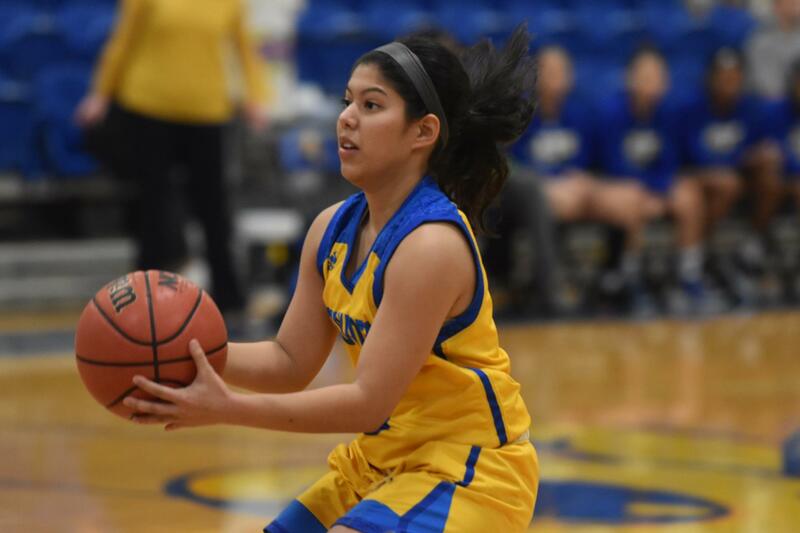 Looking to make up some ground, LETU managed to find their success from behind the arc by sinking a trio of threes in the final minutes of play. Despite the efforts and late surge, LeTourneau would be unable to pull any closer than 10 as a 28-point output in the fourth from Texas-Tyler was too much to overcome. Thorne scored a team-high 10 points, while Whitfield led LETU with nine rebounds. Junior point guard Claudia Moonsammy added a career-high six assists. LETU would make the most of their 13 forced turnovers by outscoring UTT 19-16 in points off turnovers but would have issues on the glass as the Patriots held a 44-26 advantage on the boards. Shooting an impressive 60 percent (6-of-10) in the opening quarter, the YellowJackets ended the contest shooting 31.4 percent (16-for-51) from the field while the Patriots used a healthy 47.6 percent (10-of-21) shooting performance in the fourth to earn the victory. LeTourneau will get a chance to avenge their loss as they prepare for their second consecutive matchup against the Patriots on Thursday, January 31 at Solheim Arena. Tip-off is set for 5:30 p.m. between the two squads in their last contest at NCAA Division III foes. LAKE CHARLES, La. 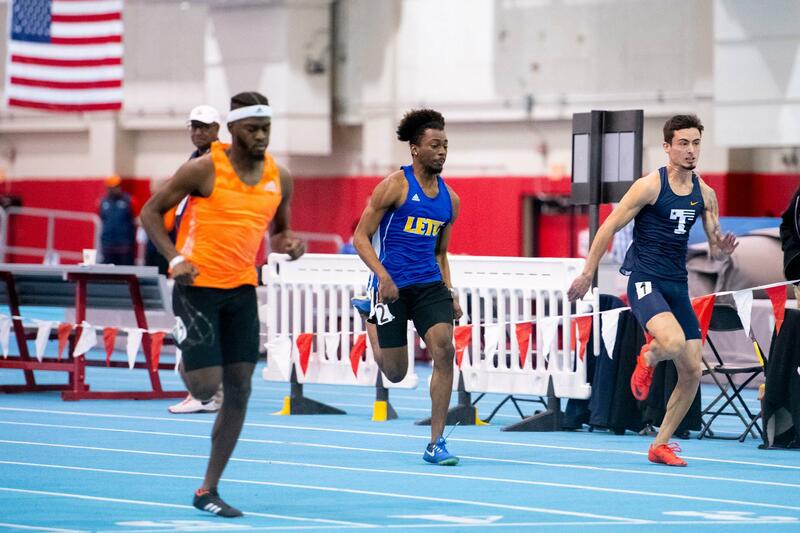 – Setting numerous personal records as part of 11 top-10 finishes, the LeTourneau University men’s track and field team would show well against primarily NCAA Division I competition at the McNeese State University Indoor Invitational held at the Ralph O. Ward Recreation Complex in Lake Charles, Louisiana on Friday, January 25. No team scores were kept for the YellowJackets at the meet, as the event was scored as an NCAA Division I only meet despite representation from NCAA Division III and the NAIA in addition to Division I programs. A week after taking fourth in the pole vault, freshman Jack Miller would land his first top-three finish by taking third with a mark fo 4.75 meters (15 ft. – 7 in.) to edge Austin Parrish (fourth) and Collin Jones (fifth) who both recorded marks of 4.60 meters (15 ft. – 1 in.). Sophomore Alex Hindman would also compete in the pole vault for LETU but would be unable to record a mark in his only event of the day. Landing a sixth-place finish was the 4×400 meter relay team of Dalton Heichelheim, Colton Pounders, Solomon Siniard, and Jones with a time of 3:35.53 while Keishaun McMillian would grab sixth in the triple jump with a career-best indoor mark of 12.27 meters (40 ft. – 3.25 in.). Finishing just back of McMillian would be Nate Berlandier with a seventh-place finish in the triple jump (12.18 meters, 39 ft. – 11.5 in.) as the duo would also compete in the long jump with McMillian recording a mark of 6.44 meters (21 ft. – 1.5 in.) and Berlandier recording a mark of 6.07 meters (19 ft. – 11 in.). Leading LeTourneau in the long jump would be Stanley Williams with a school-record 6.72 meters (22 ft. – 0.75 in.) for a seventh-place finish with Pounders recording the other seventh-place finish for the YellowJackets in the 55-meter hurdles (8.75 prelims, 8.80 finals). Lorien Nightingale would earn his first top-10 finish of the season by taking 10th in the 800 meters (2:06.16) with Wesley Anderson (2:12.53) and Nathan Glastetter (2:14.65) also competing in the event for LETU. Williams would go on to take eighth in the 200 meters with a new indoor-best time of 23.74 with Siniard just missing out on a top-10 finish by taking 11th with a time of 24.04. Heichelheim would run the 400 meters for LeTourneau, taking 11th with a time of 53.39 while freshman Matt Nusser made his collegiate track debut with a time of 5:21.37 while Daniel Lopez (10:17.25) and Jared Rose (10:59.59) competed in the 3,000 meters. Rounding out the day’s events for the YellowJackets would be Judson Iverson (10.07 meters, 33 ft. – 0.5 in.) and Jones (8.72 meters 28 ft. – 7.5 in.) in the shot put along with Iverson (10.10 meters, 33 ft. – 1.75 in.) and Adrik Kling (8.94 meters, 29 ft. – 4 in.) in the weight throw. LeTourneau will look to further improve their marks on Friday, February 1 when they compete in the Texas Tech Open at the Sports Performance Center in Lubbock, Texas. The meet will be held over two days, with a full day of action concluding the competition on Saturday, February 2. LAKE CHARLES, La. – Led by a third-place finish in the pole vault from Kaylee Packer along with a fifth-place finish from Alexis Segura in the mile run and sixth-place finishes from Tori Field in the 55 meter hurdles and Julianne Hood in the 800 meters, the LeTourneau University women’s track and field team would land eight top-10 finishes. 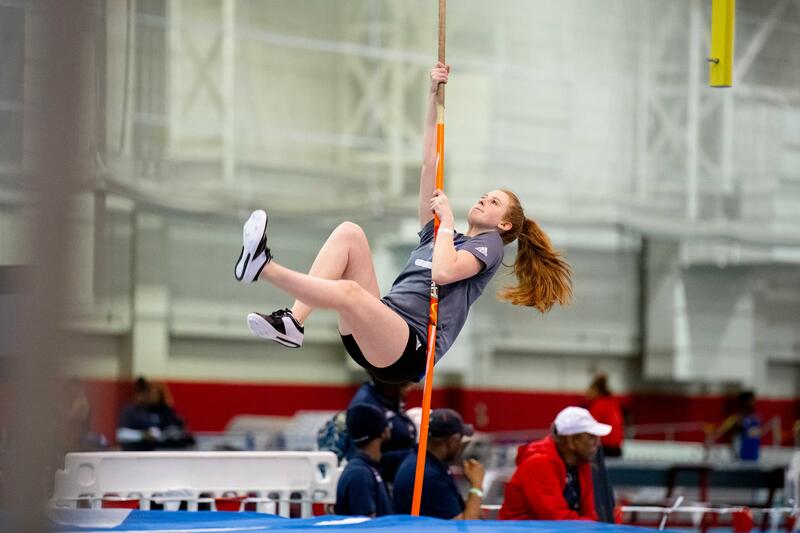 It was at the McNeese State University Indoor Invitational held at the Ralph O. Ward Recreation Complex in Lake Charles, Louisiana on Friday, January 25. No team score was kept for the YellowJackets as the meet featured NCAA Division I programs along with Loyola University New Orleans and Huston-Tillotson of the NAIA primarily. Packer’s third-place finish came with a mark of 2.90 meters (9 ft. – 6.25 in.) and set a new indoor-school record while Field ran times of 10.33 and 10.46 in the 55-meter hurdles to take her first top-10 finish of the season. Segura improved upon her season-best mile run time by over 10 seconds to take fifth while Hood made her 2019 season debut by running a time of 2:48.54 to earn the top-eight finish. Freshman McKenzie Craycraft would also run in the 800 meters and finished in seventh (3:04.56) while Ro Galloway would also receive a seventh-place finish in the 200 meters with a time of 27.78. Taking ninth-place in the 55-meter hurdles would be Lexi Funk with a time of 10.41 before taking 10th in the 600 meters (1:52.56) while Victoria Hood would round out the top-10 finishes with a 10th-place finish in the mile run (5:50.89). Narrowly missing out on a second top-10 finish was Field in the triple jump with a mark of 9.91 meters (32 ft. – 6.25 in.) along with Kristyn Matthews who would take 11th in the 200 meters (29.49). The field also competed in the long jump and placed 14th with a mark of 4.75 meters (15 ft. – 7 in.) while Galloway (7.86) and Matthews (7.89) both ran career-bests in the 55-meter dash. LeTourneau would also see Allison Fuller(13:31.39), and Bridey Davis (14:01.66) make their season debuts by running in the 3,000 meters to get their 2019 campaigns underway. Other competitors for LeTourneau on the day would be Rebekah Stevenson who would record marks of 7.91 meters (25 ft. – 11.5 in.) in the shot put and 11.18 meters (36 ft. – 8.25 in.) in the weight throw while Alicia Griscom recorded respective marks of 6.89 meters (22 ft. – 7.25 in.) and 11.33 meters (37 ft. – 2.25 in.) in the same events. LETU will next be in action on Friday, February 1 to kick off the Texas Tech University Open which gets underway at 3:00 p.m. at the Sports Performance Center in Lubbock, Texas. The meet will conclude on Saturday, February 2 and will feature a full day of action after Friday’s opening afternoon/evening of events. 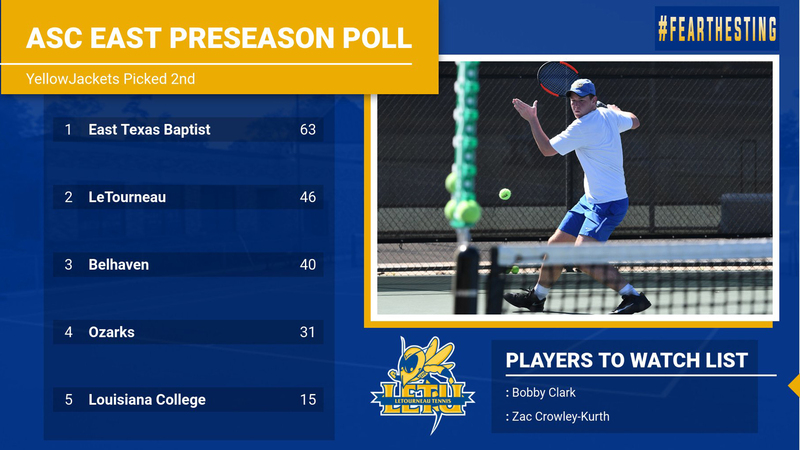 RICHARDSON, Texas – The LeTourneau University men’s tennis team has been picked to finish second in the East Division of the American Southwest Conference in the annual preseason poll. The YellowJackets landed two athletes on the players to watch list in Bobby Clark and Zac Crowley-Kurth. LETU received 46 points and a single first-place vote in the poll which was released Friday afternoon following the league’s head coaches’ vote, and trails only East Texas Baptist who received 63 points and 12 first-place votes. Following LeTourneau and ETBU are Belhaven (40 points), Ozarks (31 points) and Louisiana College (15) points as the University of Texas-Tyler is ineligible for this year’s ASC regular season title and ASC Championships due to NCAA Division II Reclassifying. Reigning ASC West Champion Texas-Dallas was picked to win the West Division again after receiving 89 points and 11 first-place votes. Earning 62 points, Hardin-Simmons was tabbed for a second-place finish. Not far behind was Concordia Texas who was projected to finish third as they picked up a single first-place vote and 60 total points followed by Mary Hardin-Baylor (54 points, one first-place vote), McMurry (54 points), Howard Payne (26 points) and Sul Ross State (19 points). Clark will enter his first season as a YellowJacket after a substantial fall showing this past September. Coming to LeTourneau from Fort Worth, Texas, Clark was a three-time State Champion at Lake Country Christian School where he received first-team All-State honors and managed to earn a consolation “B” flight singles championship at the ITA Fall Regional by closing out the tournament with three straight victories. Crowley-Kurth enters his senior season after recording four singles wins as a number four singles player in 2018. The San Antonio, Texas native also appeared in 18 doubles matches a year ago and recorded four wins with partner Robby Bundy. This past fall, Crowley-Kurth teamed up with Clark as the duo took third place in the flight “C” doubles competition at the ASC Fall Invitational before going on to win the consolation “C” singles flight at the ITA Fall Regional in Abilene, Texas. LeTourneau will open their 2019 campaign on Sunday, February 17 with a 1:00 p.m. non-conference home match against Texas-Dallas. CLARKSVILLE, Ark. – After overcoming a 15-point halftime deficit, the LeTourneau University men’s basketball team would be outscored 9-3 in the final 2:57 of an 81-75 road loss at the University of the Ozarks inside Mabee Gymnasium in Clarksville, Arkansas on Thursday, January 24. Following the defeat, LETU drops to 11-7 overall and 7-4 in American Southwest Conference action while the Eagles improved to 5-14 overall and 4-6 in conference action as the two teams will square off again next weekend. A quick start for the YellowJackets saw LETU score the first five points of the game before seeing Ozarks score five points of their own which would be followed up by a Christian Seidllayup to allow LeTourneau to reclaim the lead at 7-5 with 17:34 remaining in the first half. 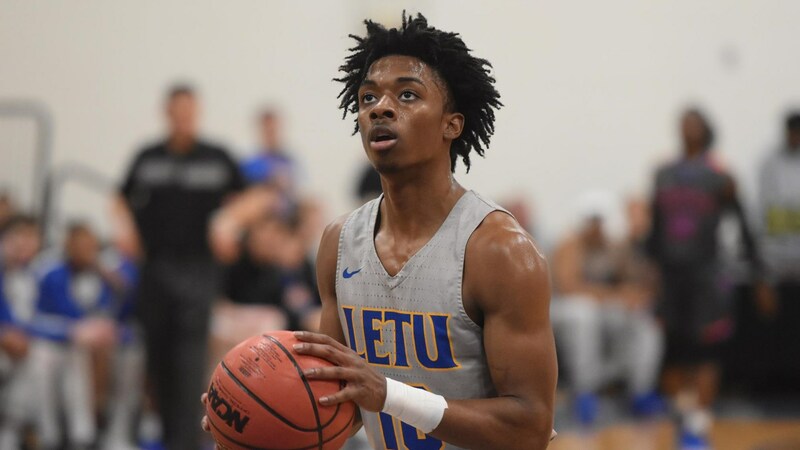 LETU would manage to maintain their lead through the opening six minutes of play until a Jacobe Davis jumper tied the game at 11-11 before seeing Justin Moore allow LeTourneau to grab the lead once again with his second triple of the game. A 9-0 UO run would give the Eagles a 20-14 lead with just under 12 minutes remaining in the first half before seeing the YellowJackets respond with a bucket and free throw from senior C.J. Bird to pull LeTourneau back within three. The LETU offense would then go silent as Ozarks scored 11 of the next 13 points with both LeTourneau points coming on separate trips to the charity stripe which allowed the Eagles to grab a 31-19 lead with 7:19 left before halftime. In a double-digit hole, the YellowJackets would be unable to make any headway heading into halftime as Ozarks would keep the pressure on LETU and push their lead to 15 which is where it would wind up with the score sitting a 44-29 in favor of Ozarks at halftime. A quick 6-2 spurt to open the second half by LeTourneau brought the YellowJackets back within 11 at 46-35 before eventually getting the deficit down to single digits at 50-42 with 14:52 remaining. The YellowJackets would continue to chip away at the halftime deficit, using an Elijah Gerber layup to get within six at 52-46 but would see five straight points by Ozarks put the Eagles back up double-digits. Seven-straight points by LeTourneau allowed LETU to close the deficit to single-digits for good as the score would sit at 57-53 with 11:40 remaining in the contest with junior Nate West hitting a transition three two minutes later to get LeTourneau within one possession at 61-58. Andrew Eberhardt would allow the YellowJackets to reclaim the lead with a three to put the score at 63-61 in favor of LeTourneau, but Ozarks would be quick to respond by scoring the next four points to hold a 65-63 lead with 6:41 remaining. Back-and-forth things went with Moore getting a layup and free throw to put LETU back on top momentarily as Ozarks would use a 7-2 run to grab a 72-68 lead heading into the final four minutes of action. Moore and West would combine to score the next four points of the contest and knot things at 72-72 before seeing UO score four of the following five points to claim a 76-73 lead with 1:46 remaining. Both squads would trade buckets over the next 1:07 of action to allow Ozarks to maintain a three-point lead as the YellowJackets would be unable to take advantage of two free throws with 21 seconds remaining to cut into the Eagle lead. Ozarks would take advantage of miscommunication by the YellowJacket defense and score a quick layup four seconds later to go up five at 80-75 before adding on one final free throw following an empty possession by LeTourneau to hand LETU a six-point defeat. UO would make the most of a 54.6 percent (18-of-33) shooting performance in the first half as the YellowJackets would be forced to try and overcome a 9-for-32 (28.1 percent) shooting performance in the first half to finish 28-of-62 (45.2 percent) from the field in the game. Free-throw shooting (14-of-23, 60.9 percent) and rebounding (39-37 Ozarks) also proved to be an issue for LeTourneau Thursday evening, with Ozarks scoring 17 fast break points and nine second-chance points. Leading all scorers in the game would be Moore with 21 points and five assists while Loggins would add 15 points and 12 rebounds. West would be limited to just 13 points in the contest and grab four rebounds to go along with two assists. LeTourneau will conclude non-conference play with consecutive games against Texas-Tyler beginning on Saturday, January 26 at 3:00 p.m. in Tyler. UTT and LETU will be meeting for the final two times as NCAA Division III counterparts as the Patriots are in their first year of NCAA Division II Reclassification. Texas-Tyler is 8-11 overall following Thursday’s 88-78 home defeat to East Texas Baptist University. CLARKSVILLE, Arkansas – Despite an early first quarter lead, the LeTourneau University women’s basketball team would fail to find their offensive rhythm in a 56-37 road defeat to the University of the Ozarks at Mabee Gymnasium in Clarksville, Arkansas on Thursday, January 24. The loss drops the YellowJackets to a 5-13 overall record and a 2-7 standing in the American Southwest Conference. The Eagles improved to 10-8 overall and 7-3 in ASC action with the victory. 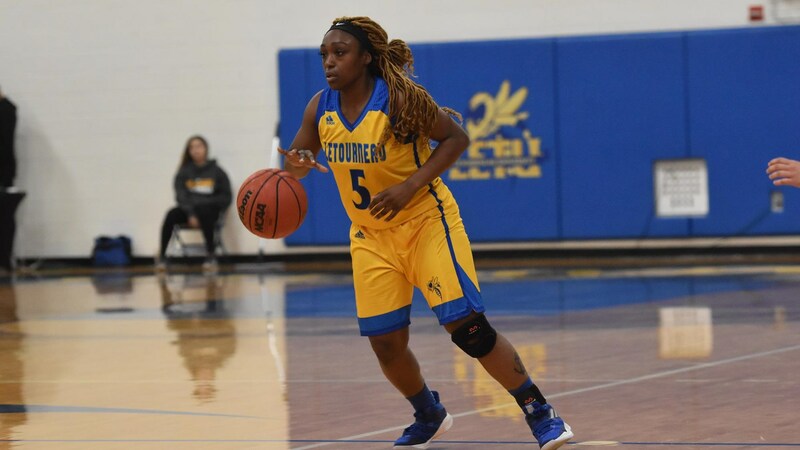 Five consecutive points coming from junior guard Alexandria Thorne was enough to keep LeTourneau within striking distance after trailing 7-3 until a Claudia Moonsammy three-pointer with 4:37 left in the first quarter sparked a 7-0 YellowJacket run to put LETU up 12-9. Thorne continued her dominant performance as she strung together four more points to end the period scoring 9 of LeTourneau’s 12 points to put them back just one point behind of the Eagles at 13-12. Offensive woes found their way to the YellowJackets in the second quarter as Thorne and company would be limited to one basket which allowed UO to claim a 34-16 lead at intermission. Coming out of the break, Olivia Eweni would attempt to shift momentum as she scored the first two points of the third quarter until the Eagles answered with a 6-0 run to put LETU in a 40-18 hole. LeTourneau would use the final two minutes of the quarter to make up some ground, using the charity stripe to their advantage by connecting on six of their eight free throws despite trailing 46-27 heading to the fourth. Two baskets in the opening minute of the final period would allow LeTourneau to gain some quick momentum and cut the deficit to 15 at 46-31, but the offense would again become sporadic and prove to be not enough to spark a comeback for the YellowJackets. Thorne would put up a team-high 15 points for the YellowJackets while Keauna Whitfield would lead the YellowJackets with nine rebounds. LETU would do their best to overcome a 13-of-57 (22.8 percent) performance from the field by limiting their turnovers to just 10 while forcing 14 turnovers from the Eagles. Ozarks would manage to hold a 10-9 advantage however in points off turnovers. The Eagles would also manage to take advantage on the glass, grabbing 11 offensive and 36 defensive boards while holding the YellowJackets to just 31 total rebounds. LeTourneau will head back to their home state to travel to Tyler, Texas to face the University of Texas-Tyler in a 1 p.m. matchup on Saturday, January 26th. The Patriots will enter Saturday’s game holding a 10-8 overall record following a 72-64 home defeat against nationally-ranked East Texas Baptist Thursday night. 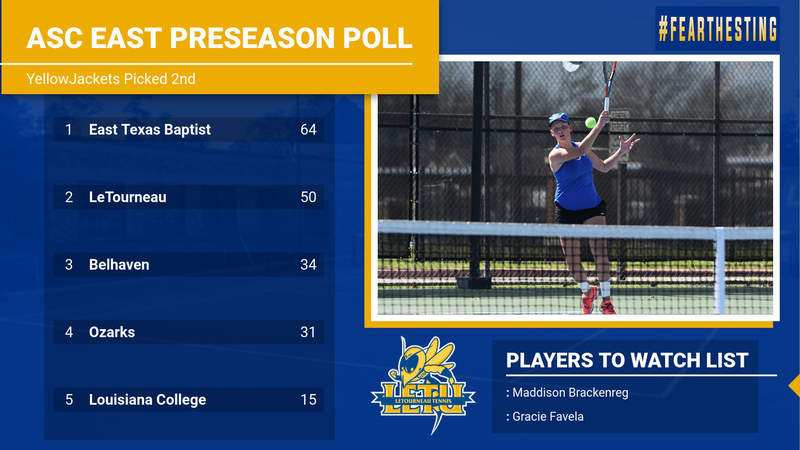 RICHARDSON, Texas – The LeTourneau University women’s tennis team has been picked to finish second in the American Southwest Conference East Division in the annual preseason poll while juniors Maddison Brackenreg and Gracie Favela have been named to the players to watch list. LETU received 50 points in the poll, which was released Thursday afternoon following a vote of the league’s head coaches, and trails only East Texas Baptist University (64 points, 12 first-place votes) in the East Division. Belhaven (34 points), University of the Ozarks (31 points) and Louisiana College (15 points) rounded out the East Division at the University of Texas-Tyler is ineligible for this year’s ASC regular season title and ASC Championships due to NCAA Division II Reclassifying. Over in the West Division, Texas-Dallas has been picked to win the division with a total of 89 points and 12 first-place votes followed by Hardin-Simmons which secured 62 points. McMurry University (61 points) was tabbed for a third-place finish and was followed by Concordia Texas (60 points, one first-place vote), Mary Hardin-Baylor (40 points), Howard Payne University (26 points) and Sul Ross State University (25) to round out the poll. A native of Melbourne, Australia, Brackenreg was named ASC East Division Tennis player of the week once last year en route to being named ASC East Division Newcomer of the Year and second-team All-ASC East Division at number one singles. The junior appeared in 16 singles matches and 18 doubles matches and led LETU to 10 wins at number one singles, and nine doubles match. Favela will enter her second year with the YellowJackets after being named Second-Team All-ASC East Division at number three singles last season while earning seven wins at number three singles and a team-high 10 doubles win. The Brawley, California native went 4-1 in ASC doubles matches with partner Katy Hall and earned three ASC victories at number three singles in 2018. LeTourneau opens up their 2019 campaign at home on Sunday, February 17th with a home match against ASC West favorite Texas-Dallas at 3:00 p.m.